Introducing our Hard Case line for Samsung Phones. 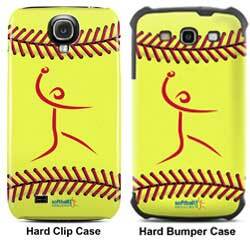 Now you can protect your Samsung phone in a softball printed, protective case from Softball Excellence! Hard Clip Case - Protect your device and keep it's sleek, slim look with our one-piece, form fitting polycarbonate Clip Cases featuring matching rich, full color edge-to-edge artwork. Hard Bumper Case - Get even better protection with a matching bumper case! It's the perfect blend of exceptional protection and style featuring a rugged, shock-absorbing silicone base layer wrapped by a high-impact shell with gorgeous full-color artwork. Our hard cases are designed to work with or without a softball iPhone skin - but we think having the matching softball Samsung skin looks amazing.